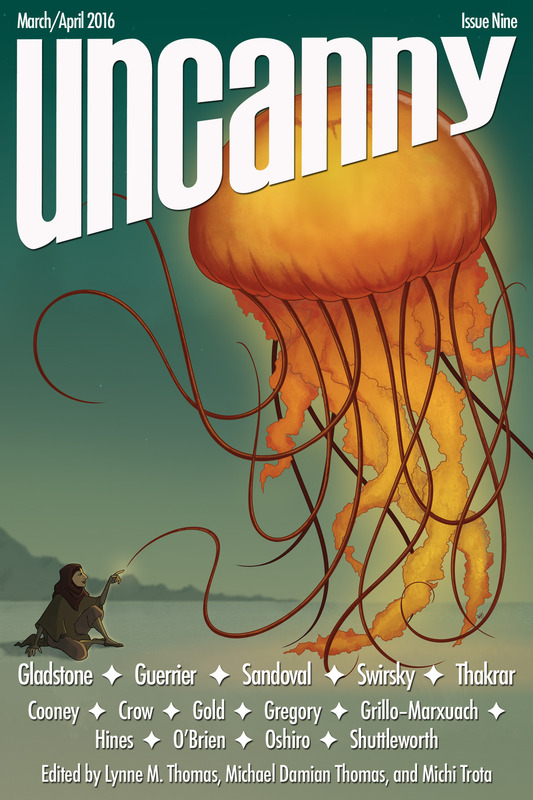 "The Shadow Collector," by Shveta Thakrar [bio] (edited by Lynne M. Thomas and Michael Damian Thomas), appeared in Uncanny Magazine issue 9, published on March 5, 2016. Pro: The garden with the talking blossoms is enchanting. The queen isn't portrayed as evil but rather as a busy, pressured monarch who doesn't realize the harm she does. The story does tell a complete tale, of how Rajesh came to possess (or dispose of) the flowers he had come to consider his own. Con: There are lots and lots of loose ends with this one. Why did he want the shadows in the first place? How did he know they'd turn into wings for his girls? Why kill the queen when he could have just run away. Very mythical and dream-like, and as such, I not quite sure what to make of it. But I liked it, especially the lotus girl's weird pronouncements.